This was originally published in The Conversation.com 30 September 2014. A steady infiltration of scientists onto Twitter has accompanied the growing recognition that a social media presence is just as important as taking the podium at a conference. Social media is leading to new ways for scientists to collaborate and communicate. Indeed, mentions on Twitter can amplify a researcher’s scientific impact. But like all social media forms, it’s not always playing nicely together in the playground. Science magazine this month published a list of 50 science stars on Twitter it said were the “50 most followed scientists on the social media platform”. Unleashing the list provoked an instantaneous and loud response. Where are all the women in the list? Only four women were listed – all from the US with the first, planetary scientist Carolyn Porco @carolynporco, at number 23. Where were the people of colour? The diversity in nationality (39 from the US, ten from the UK and one from Sweden)? A tweeting storm of outrage erupted; hashtags such as #WomenTweetScienceToo evolved by scientist and science communicator Mónica Feliú-Mójer on @moefeliu, blossomed and spread. Names were put forward of obvious inclusions, of any missed scientists and rival lists – such as In Response to the Top 50 Science List, the Twitter hashtag #WomenTweetScienceToo and The Real Science Stars of Twitter blog – spawned forth. Lists to combat lists-weapons in the war of Twitter sovereignty. Clearly being high in the pecking order on Twitter now matters in a post-normal science world. 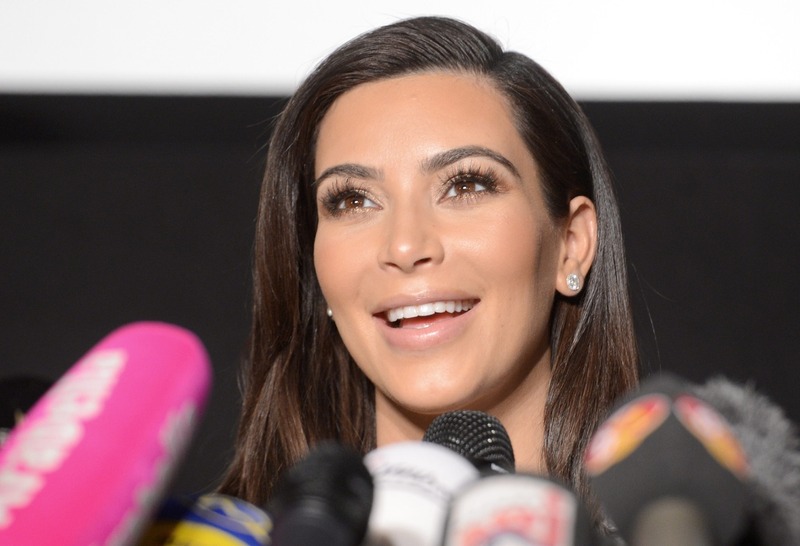 The Science list was a response to a much debated, supposedly satirical Genome Biology publication by the University of Liverpool’s Neil Hall, who put put forth the Kardashian Index – a comparison of the number of Twitter followers a scientist has with their citations. Hall speculated that (like Kim Kardashian) there are scientists who achieve fame not for their work achievements but purely for their fame alone. He suggests if a person’s K-index hits five and above, “it’s time to get off Twitter and write those papers”. Although Hall outlined that women scientists in his study didn’t suffer inflated followings but rather the converse, his satirical piece itself fell flat, especially with women. Microbilogist Siouxsie Wiles and neuroscoentist Jean-Francois Gariepy outlined why science communication efforts, including social media use, should hold more value and the limitations of citation indices for measuring scientific worth. Anthropologist Kate Clancy eloquently explained why Hall’s piece is the worst kind of joke: a punching down at those that have least power, including women scientists. Hall had struck an off chord. Light relief eventuated via #alternativesciencemetrics and the Tesla Index – a measure of social isolation for scientists. Enter then Science’s ill thought out list, with its “finding” that Twitter stardom doesn’t mean a lack of research achievements among its top 50. It was perhaps meant to be a plug for social media use, given most scientists aren’t tweeps yet. Its near absence of women and diversity though eclipsed any key messages re the importance of social media platforms to science. Or rather it made it patently clear that there are many ways to exclude, and many ways by which biases can be propagated. The alternative lists being produced (mentioned above) are an immediate, natural and visceral response, and one I’ll admit I contributed to. Rather interestingly, since I became involved I’ve increased my Twitter followers by nearly 100 and now find myself on several lists including this of New Zealand’s science stars on Twitter. So there weren’t many women on that Science list? Let’s make a list of only women scientists and fill Twitter with women in science. Surely it’s achieving something right? Jumping up and down and saying “We’re here” – well that will get us invited to the table won’t it? The growing culture of the celebrity scientist requires consideration too. A scientist with many followers is a meaningless entity, unless beyond their own tweets they actually engage in discourse. Science science in general not the magazine) needs to far better recognise the changes inherent across science by valuing science communicators. A personal observation is that as some tweeting scientists increase their followers they often stop engaging in actual conversation. This limits their interactions to a select group (list). Twitter interactions by scientists warrants further study, including any gender differences. My tip of who to follow is someone that will respond to your interactions, rather than just self-promote. It is clear from responses to the Hall and Science articles that issues with how women are perceived and treated in science extends to social media too. 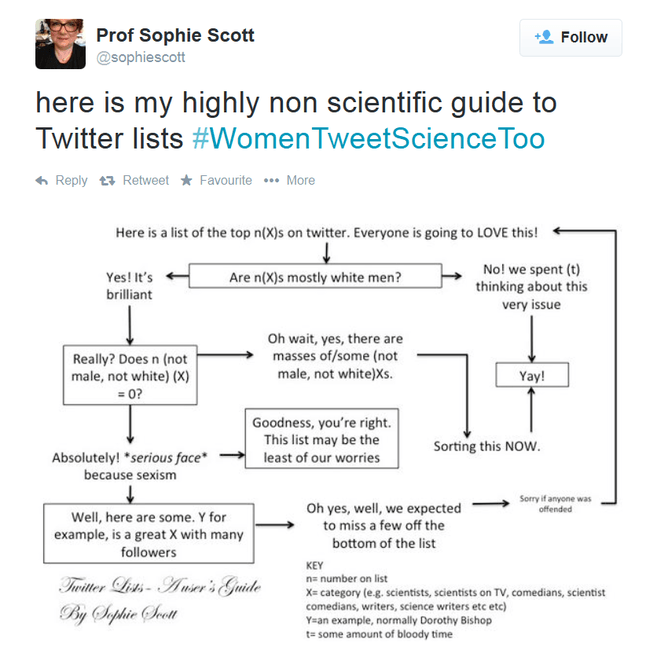 The #WomenTweetScienceToo and alternative lists are a useful first response. But on reflection we need a far stronger, better call to arms due to the enormity of issues facing women in science. The trouble with lists is someone is always excluded, even other women in science. From lack of inclusion and recognition through to physical and mental harm, the road ahead for women in science and other minorities remains a steep but we hope not insurmountable uphill. It will take action rather than lists to change the culture. Victoria Metcalf does not work for, consult to, own shares in or receive funding from any company or organisation that would benefit from this article, and has no relevant affiliations. This article was originally published on The Conversation. Update: Jacquelyn Gill has also written an excellent post on the need for action. Paige Brown Jarreau has kept the discourse going and expanded on some of the ideas in this post. Her post outlines more on the need to look at other measures of achieving Twitter ‘greatness’ such as true engagement and tips for what to really look for in scientists to follow on Twitter.